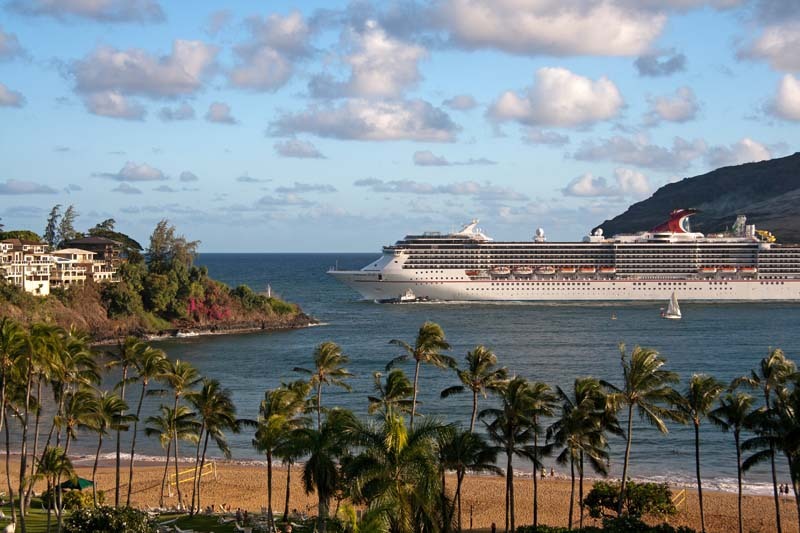 Planning to visit Kauai for your next sun-and-sand vacation? 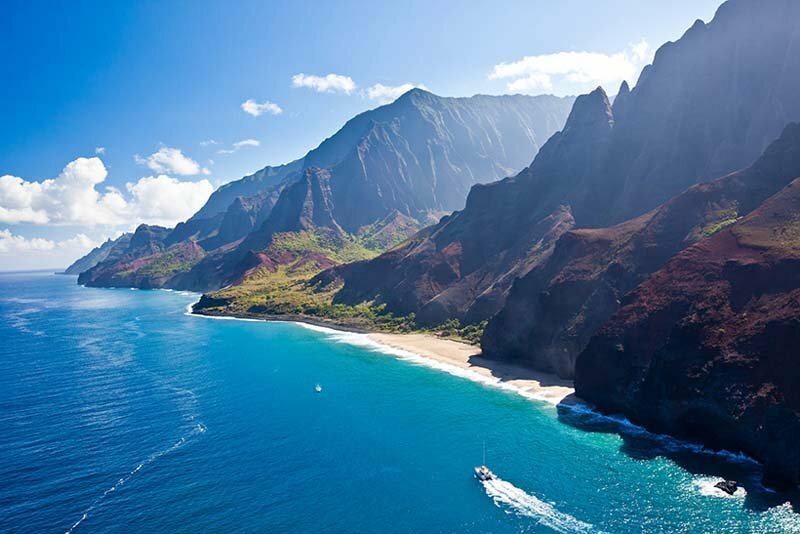 As well as seductive beaches, Hawaii’s “garden island” is also known for its lush, tropical and mountainous scenery – which means great hiking and kayaking! While Kauai has blossomed over the years, it has thankfully still managed to retain its old Hawaii feel. 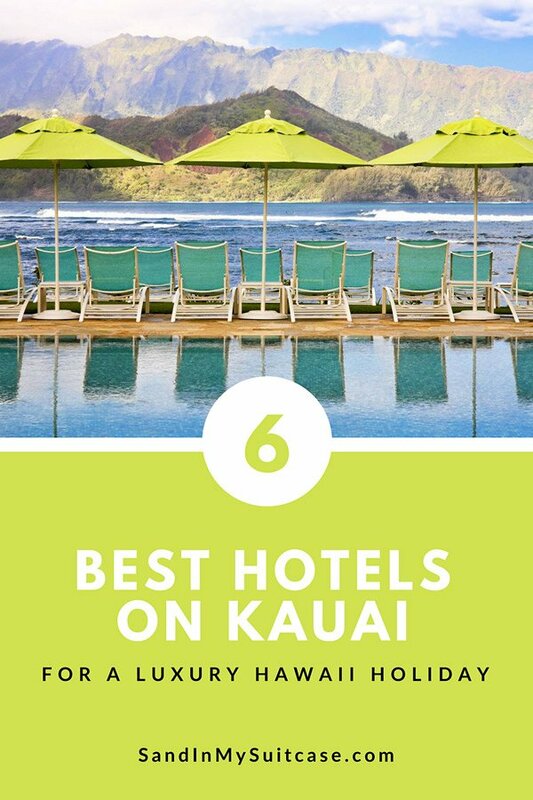 We’ve visit the island several times and stayed at all the top Kauai hotels. Yes, it’s a large, sprawling, oceanfront resort in Poipu with 602 rooms and suites. But it’s gorgeous! 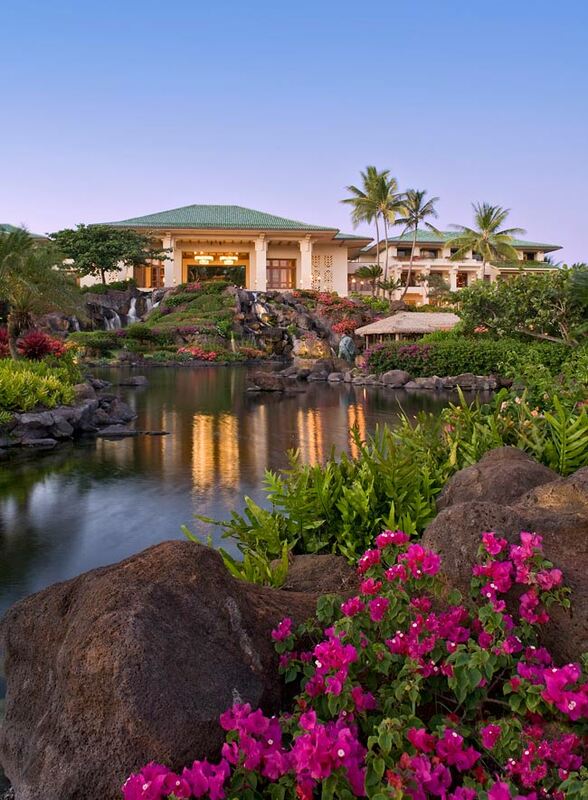 Think luxuriant grounds graced by koi ponds, waterfalls and tropical gardens. There are also three freshwater pools, including an adult pool and a lazy winding river and waterslide. Everyone! The property attracts families, couples and multi-generational groups. Treat yourself to a massage at the Anara Spa (the largest spa on the island), and you can lather up afterward underneath an outdoor lava rock shower. Daily parrot talks are fun – a wildlife handler takes a macaw from the lobby atrium for a daily show-and-tell by the beach. 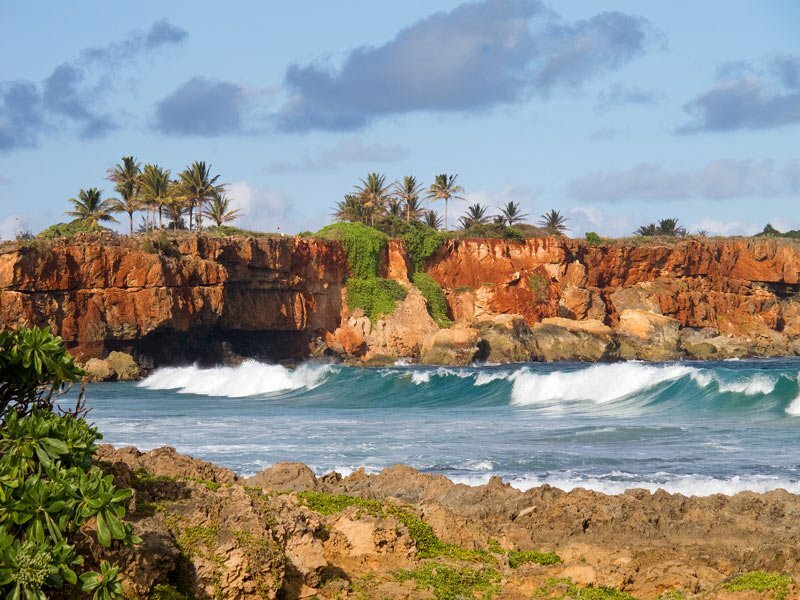 And hiking the historic Maha’Ulepu Trail along soaring red cliffs starting just beyond the property’s edge is a great way to start the day. We also like that the Grand Hyatt Kauai has gone to great lengths to be green. You’ll find complimentary water flasks in your room, which you can refill with chilled filtered water, found throughout the property. Much of its power comes from solar panels. And swimming pools are heated with recaptured heat from the air-conditioning system. After shelling out big dollars for a room here, you also have to pay an additional daily resort fee of $35. The hotel’s 121 rooms feature in-room Nespresso machines, marble showers with dual showerheads, deluxe bath amenities and free WiFi. Each guestroom also sports a private lanai. 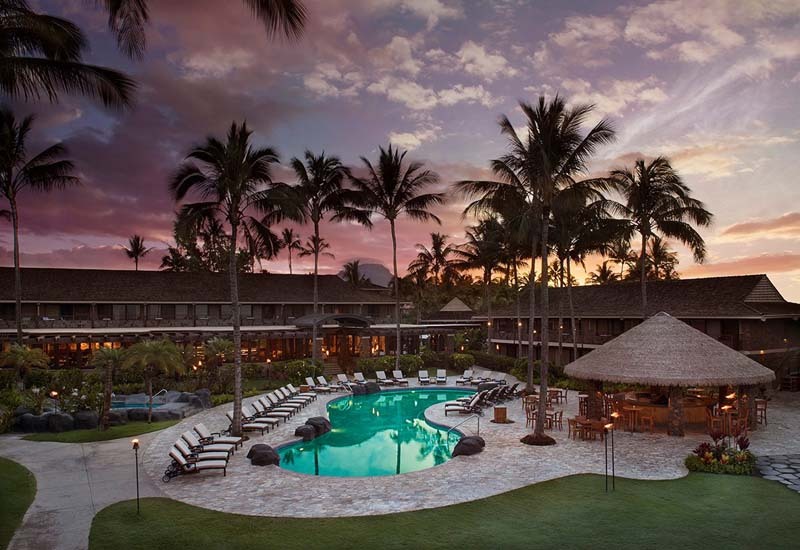 Koa Kea is one of the best hotels in Kauai for couples, if not the best. Most guests are couples – kids are discouraged. This is the place to book for a casually luxe adult getaway. 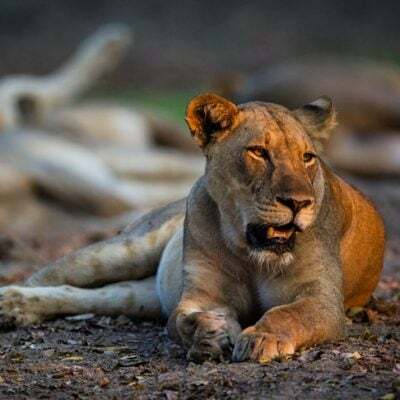 With few children, it’s also blissfully quiet. Honeymoon, anniversary or special occasion coming up? Think Koa Kea. The intimate feel is especially appealing – it’s mere steps from your room to the pool and sandy swimming beach. Oh, and have we mentioned the beach? Yes, Koa Kea is right on Poipu Beach. Garden-view rooms have a darker color scheme and aren’t as light-filled as deluxe oceanfront rooms. 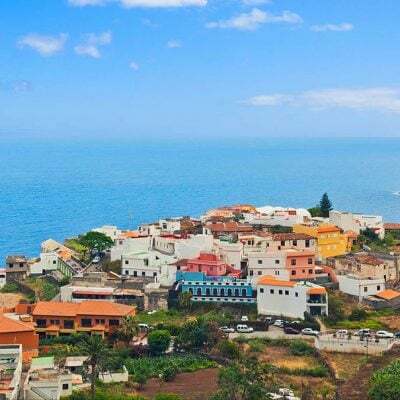 This big, beautifully landscaped, 356-room resort is found on the east coast of the island, very close to the airport (but don’t worry, you never hear planes take off or land). Nicely decorated rooms are large and come with coffee makers; all have balconies. Well maintained, the resort was spruced up recently, and waterfront fire pits were added in 2017. Golfers love teeing off on the two adjacent courses designed by Jack Nicklaus. 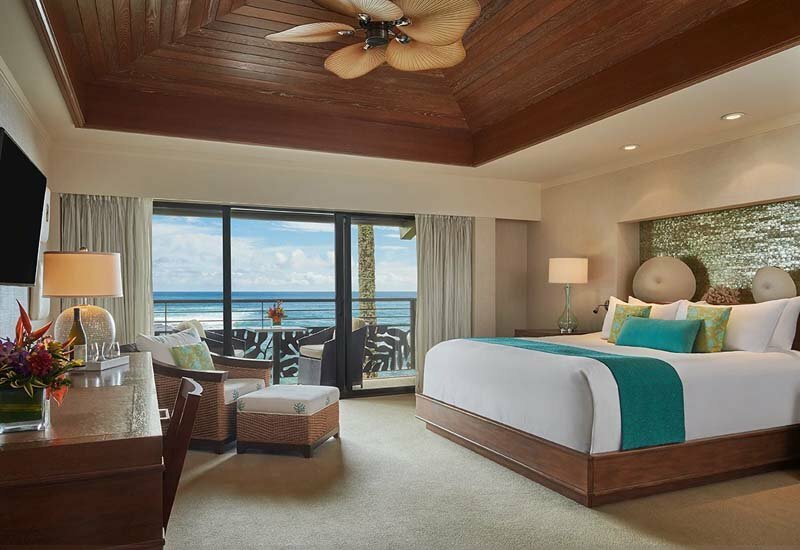 Couples and families wanting five-star resort features for less find this and more at the Kauai Marriott. The large hibiscus-shaped pool with fountains and no less than five whirlpools is a winner. 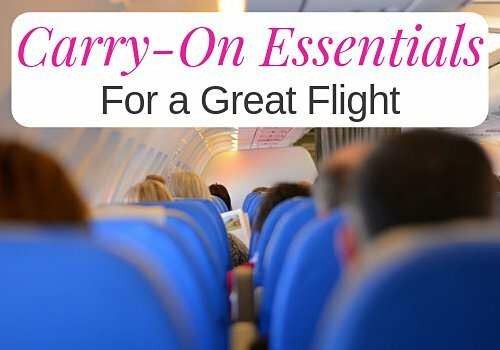 The complimentary airport shuttle is also a plus (the airport is a five-minute drive away). 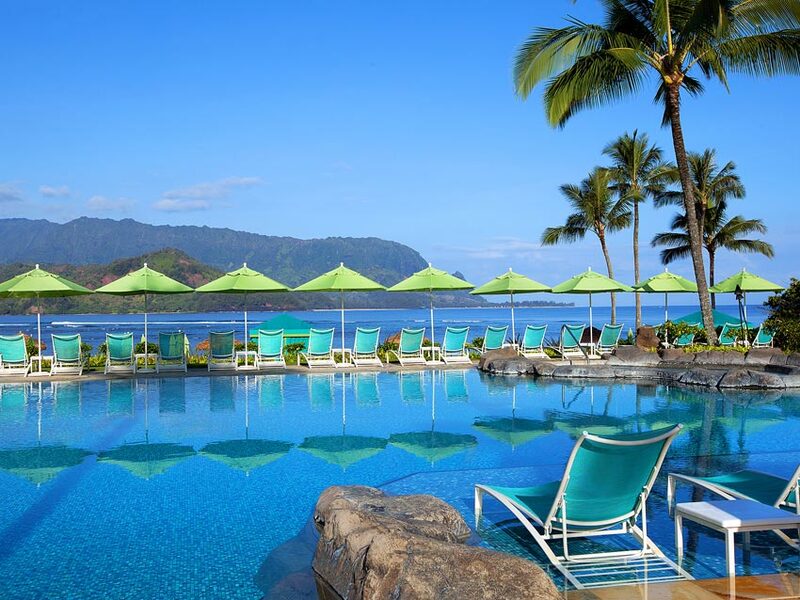 And let’s not forget that the Kauai Marriott fronts Kalapaki Beach, one of Kauai’s best swimming beaches! Bathrooms are small, and we found the sticky glass balcony doors hard to slide open. It’s ideal for luxury lovers with deep pockets – and those who love gracious glamor. Bathtubs have a view. And you can gaze at the sea while showering with mint-scented bath products from the French Remede line. Most food is sourced from within the Hawaiian Islands. 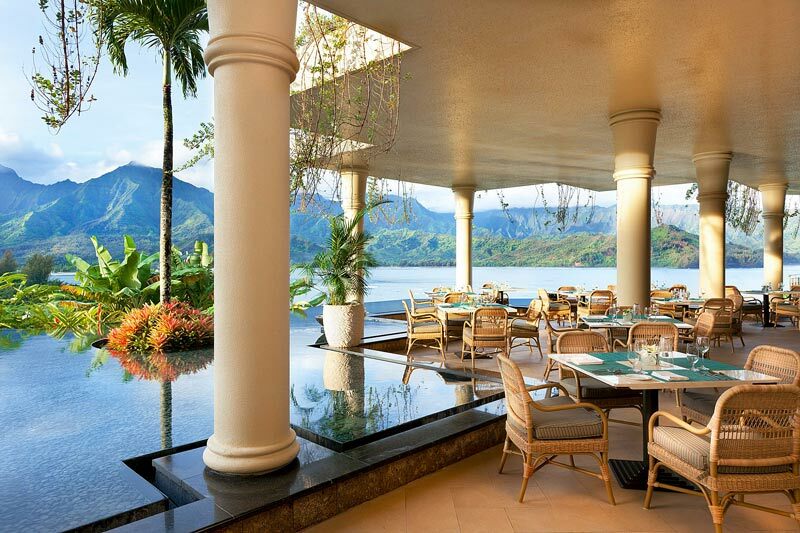 The signature Kauai Grill restaurant by Michelin-starred chef Jean-Georges Vongerichten uses organic produce and fresh local fish. Rooms don’t have lanais or balconies. And the north part of the island, where this Princeville hotel perches, gets more cloud and rain than Poipu in the south (but it’s also more lush and tropical). After some six years of construction, Koloa Landing is finally finished. 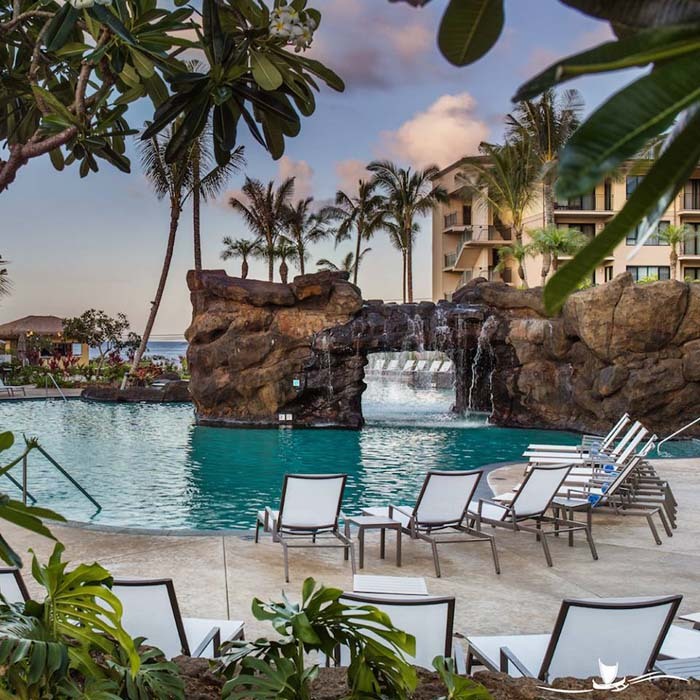 It’s a luxury condo-style resort development in Poipu boasting deluxe studios (500 sq. ft) right up to huge four-bedroom villas. One-bedroom units are 800 sq. ft., while the largest villas are 3,600 sq. ft. in size. Well-equipped kitchens with cupboards galore will appeal to your inner chef. The grounds are lovely. And the resort has three pools, including a quiet adult-only pool. 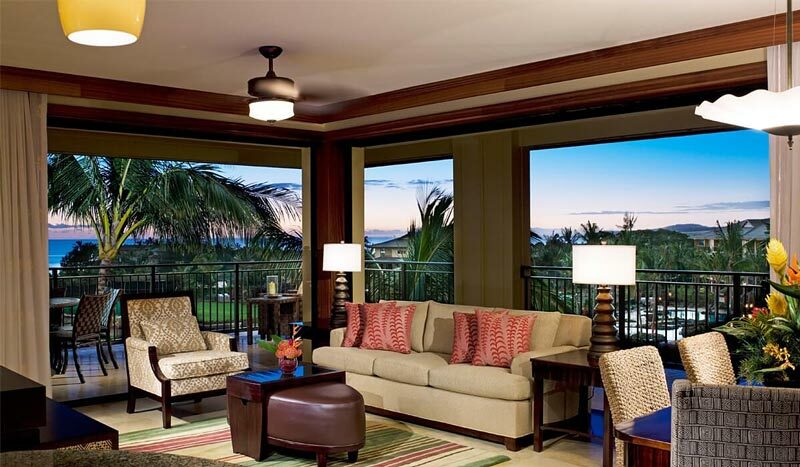 Families who enjoy eating in and travelers who want all the comforts of home will feel, well, right at home at Koloa Landing. Sometimes, you just want to kick back after a day on the beach. You don’t want to dress up and go out for dinner. At Koloa Landing, kitchenettes (in the studios) and full kitchens (in one-bedroom and bigger units) give you that option. The resort also offers a free shuttle to nearby shops and restaurants in Poipu. Koloa Landing is not on a beach. You have to drive (a few minutes) or walk (15 minutes) to get to Poipu Beach. 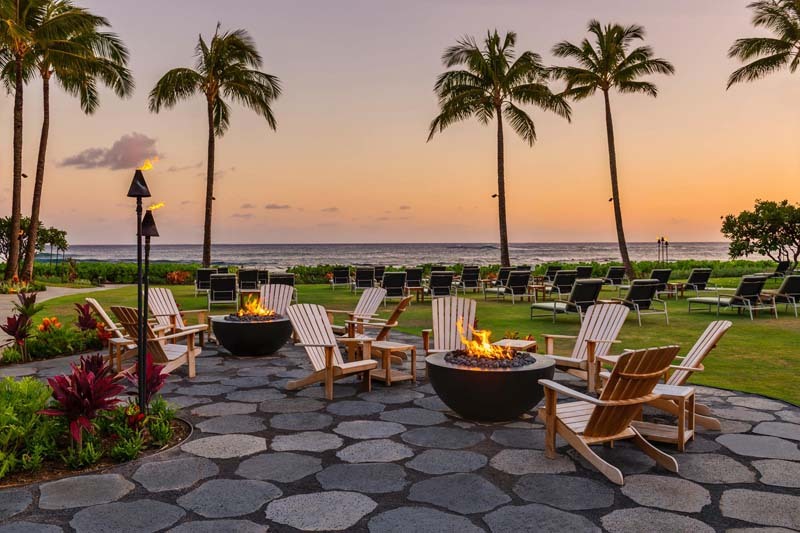 An oldie but goodie, with a distinct Hawaii (slightly dated) feel, the 4-star Sheraton underwent a “soft” revamp in 2017 and early 2018. Almost all 394 rooms have been renovated with new low-noise air-conditioners, soft blue-and-gray hues for furnishings and in-room refrigerators and coffee makers. 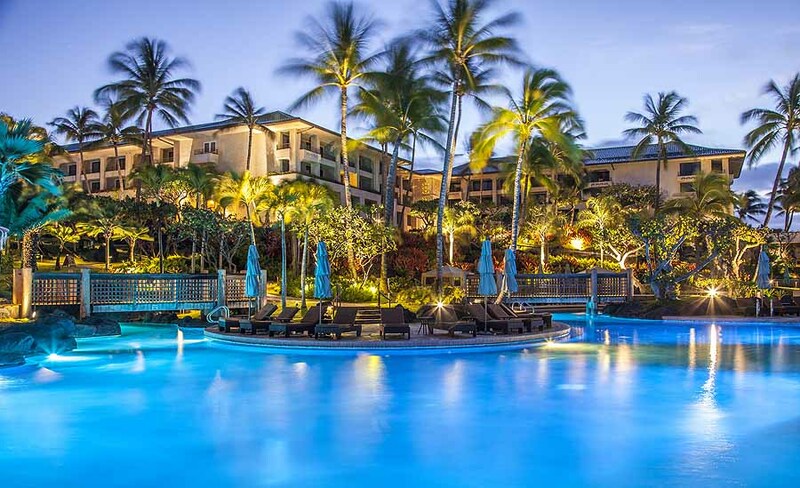 Rates are more affordable here than at the more upscale Grand Hyatt Kauai Resort & Spa. 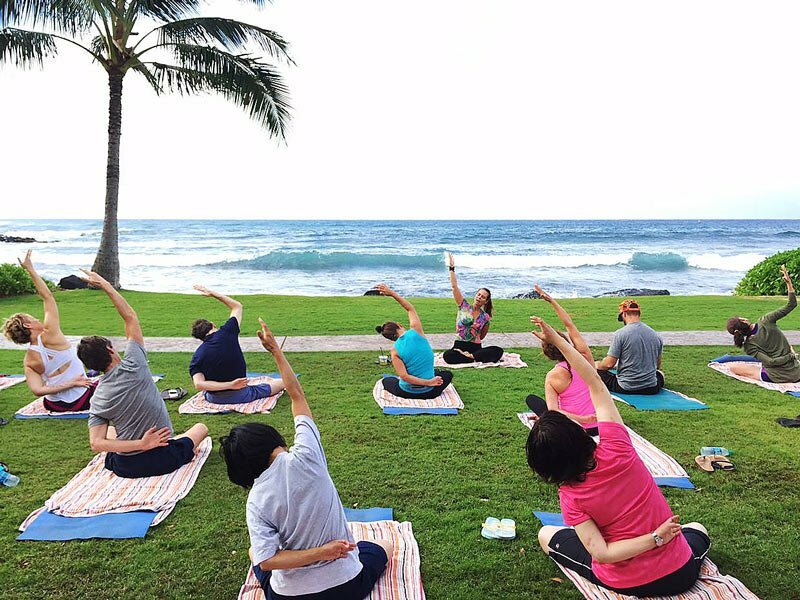 The Sheraton Kauai is best-suited for families and couples who like a fun active vibe. The real draw is the Sheraton’s fabulous location on Poipu Beach, really a series of gold-sand crescents. 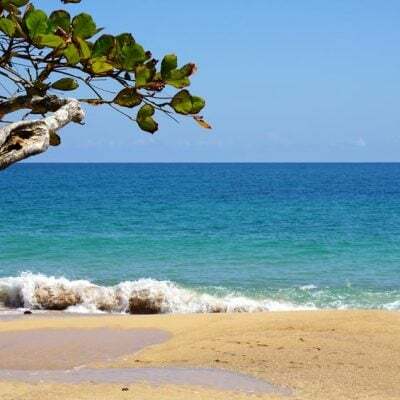 You can swim, snorkel, do a little body surfing and sometimes see sleeping monk seals on the beach. Guests have to pay a daily resort fee of $30 plus tax. (Extra charges are annoying!) The fee covers self-parking, standard WiFi (which should be free, right? ), local telephone calls, use of the gym and access to activities like yoga and hula classes. The beachside pool can also get crowded in high season – but you can splurge on renting one of the eight luxury poolside bungalows, complete with cushioned loungers, TVs, coolers and table service. What about Mexico for a luxe vacay? 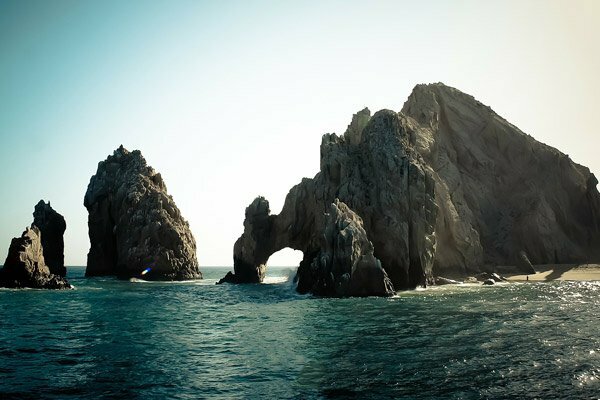 Check out these 11 fab hotels in Cabo San Lucas! 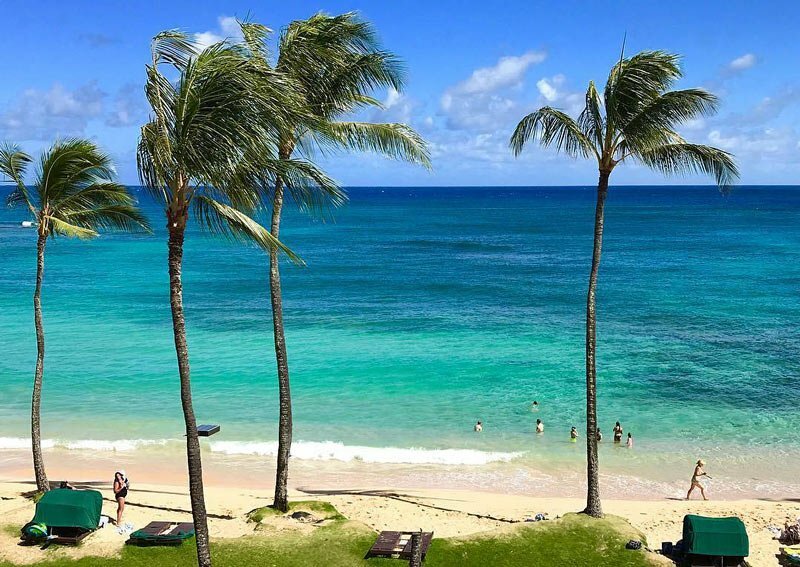 We stayed at these luxury Kauai hotels and resorts as media guests for review purposes, but the opinions here are our own; as professional travel writers, we always retain editorial control over our words. Here’s a good pin for your Hawaii Pinterest board! Have you visited the garden island? 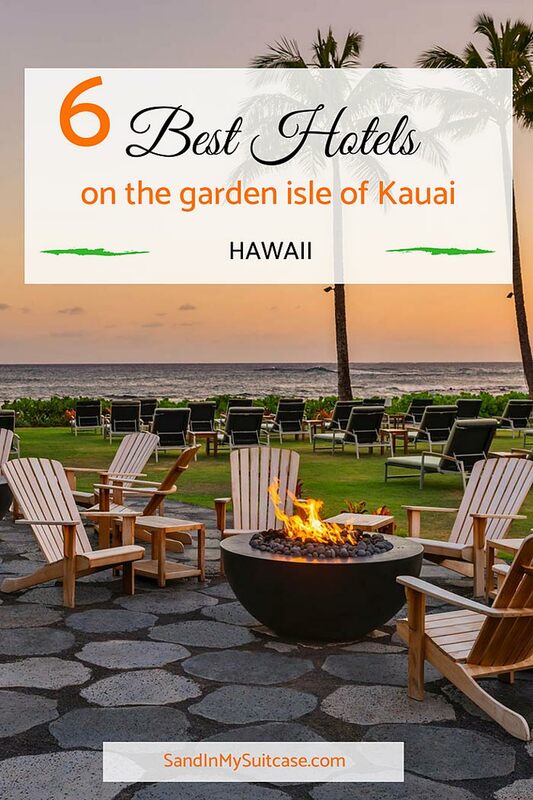 Which resort do you think is the best hotel on Kauai? These properties all sound very nice. 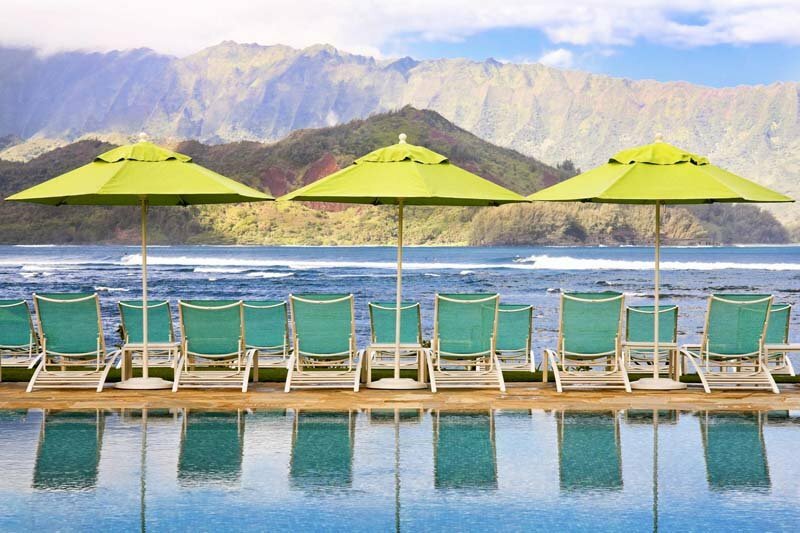 When I go to Kauai, I like staying at Kauai Vacation Rentals and Real Estate, Inc.’s properties. Have you tried them? They are all over the island and come in different sizes and price ranges. And what is really nice is they post specials every Wednesday on their Facebook page. 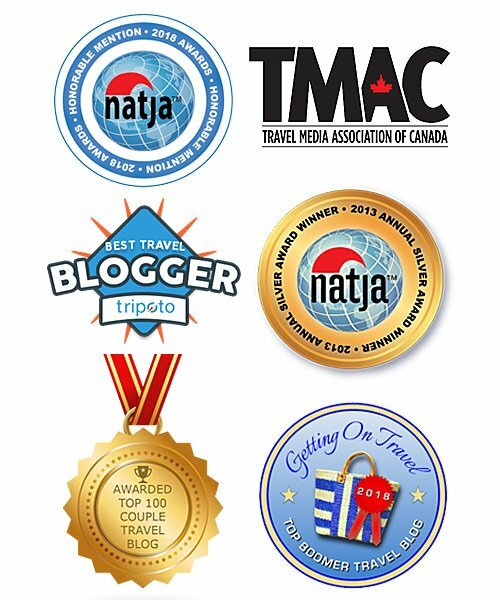 We travel with kids so staying in condos or houses works out best for us. Our kids are young so you don’t want to be in a hotel room with these guys. They need space. And I need a full size kitchen, these kids are always eating! Yes, a rental condo or vacation home makes good sense when traveling with children. 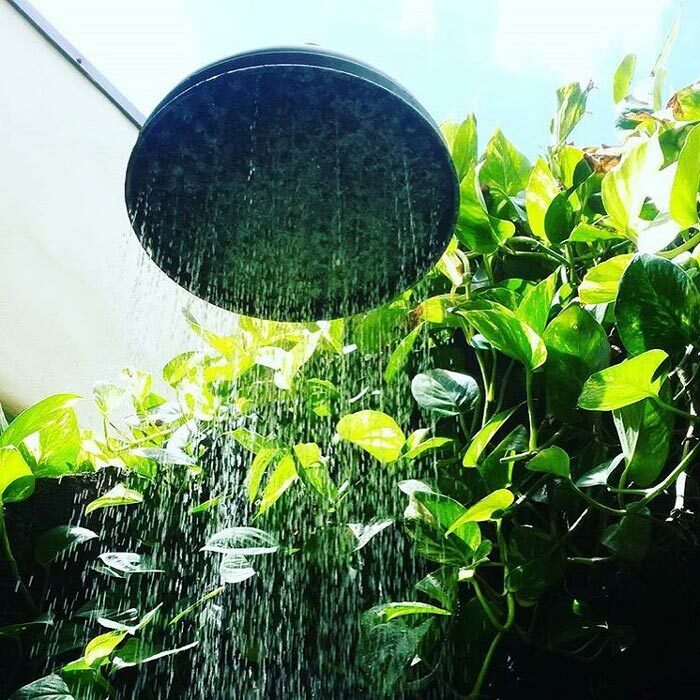 It can save a family a swack of money and everyone can spread out. 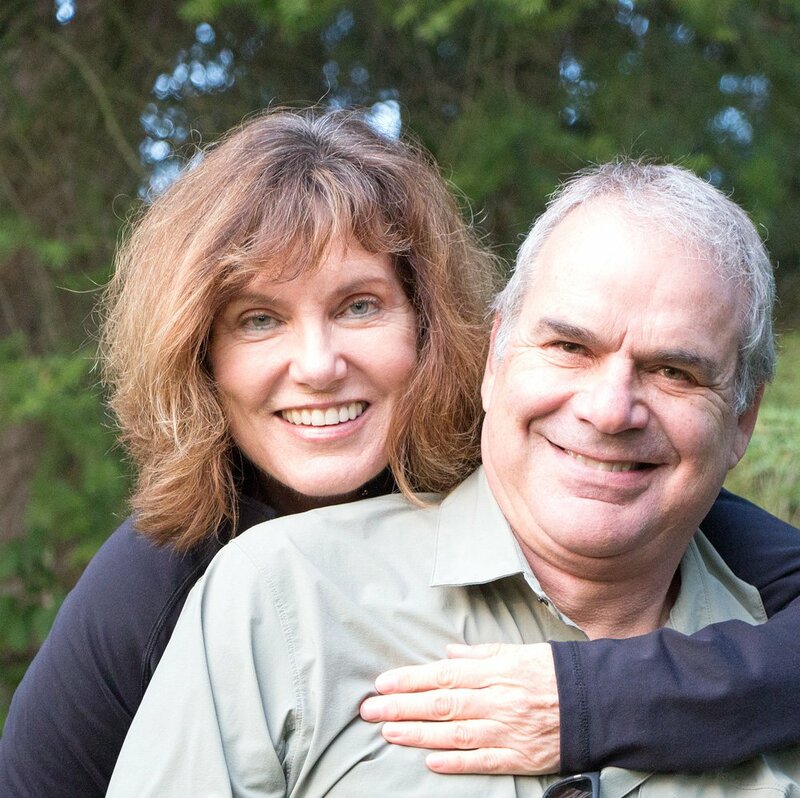 Even traveling as a couple, we love mixing it up and staying in a suite or condo with a kitchen every now and then. Sometimes you just want the comforts of home when away, at least for a few days, especially on longer trips. (And it’s better for our waistlines not to eat out all the time :-). 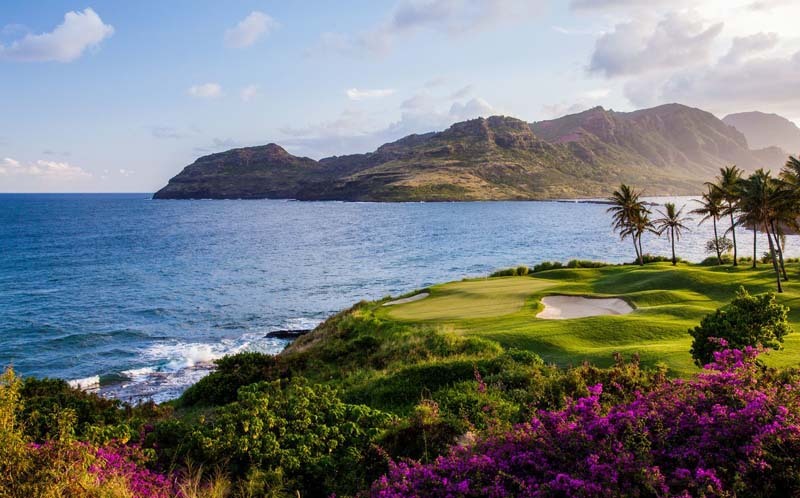 They all sound lovely but I particularly like the sound of Grand Hyatt Kauai Resort & Spa with the local cliff walk and volunteering at the Botanical Gardens sounds interesting too.